It was a prayer for peace. Out of their love for Amma and their longing to see the world freed from hatred and darkness, representatives of the 191 United Nations member countries, as well as Tibet and the Native American nation, came together in this powerful moment of beauty, innocence and friendship. Wearing the traditional dress of their countries, Amma’s children from around the world carried waters gathered from their rivers and oceans in a procession and then ceremoniously merged them in a communal pot. As the devotees—bedecked in a rainbow of colours—circumambulated the Amritavarsham50 stadium, the air was filled with a musical rendering of “om lokah samastah sukhino bhavantu,” the mantra praying for the whole world’s happiness. The devotees also carried their nation’s flag and a small candle. The flames symbolised each land’s wisdom, the waters symbolised their life and the flags symbolised their culture. Leading the procession were both the flag of India and the one specially designed for Amritavarsham50. It was something special. Everyone could feel it—the people from Japan, from Sweden, from Tibet and Mexico, from the whole planet. It showed on their faces—in their smiles and in their tears. It was a moment for kinship, for caring, a moment for believing. The more than 100,000 people watching the procession were wonderstruck. No one could have expected the beauty of what was happening. The impact of all the costumes, flags and symbolism of what was happening could be seen on the faces of all those who witnessed the event. 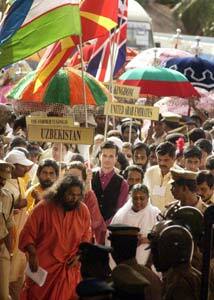 It was Amma Herself who poured the final container into the confluence—waters drawn from the sacred Ganges. She then humbly bowed down to Her children’s offering, blessing it with Her touch and prayer. As diverse as this world is, all came together and merged in Amma. Finally, with the help of the President of India and the Chief Minister of Kerala, Amma poured a pitcher of the merged water on a banyan sapling, which is to be planted at the site of the forthcoming International Amrita Meditation Centre. In India, the banyan tree is known as the kalpataru, or the wish-fulfilling tree. On the stage, Malayalam film star Padmasree Mammootty handed out 10 banyan saplings, symbolic of the 100,000 that were distributed around the stadium. 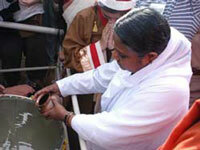 * The merged waters were then divided and distributed to Amma’s devotees to take back to their native countries. Jala Mahasangamam encapsulated the entire spirit of Amritavarsham50. The confluence of waters was the confluence of humanity itself, a celebration of our inherent inner unity as well as of the beauty of our outer diversity. For many of the thousands of Amma’s children who participated in Amritavarsham50, the procession remains as their most cherished memory, the birthday’s defining moment. It was a true coming together, an earnest prayer for peace—the peace of the world and the peace of the individual. * Fifteen days later, 108 banyan saplings were planted around the perimeter of the stadium as a reminder of the blessed event.